Ask for drum roll before placing these tasty drumsticks on the table. Because this recipe is kickin' with awesome flavors. Season both sides of chicken with salt and pepper. Place chicken in a large resealable plastic bag. In a medium bowl, combine soy sauce, worcestershire sauce, ground ginger and garlic powder. 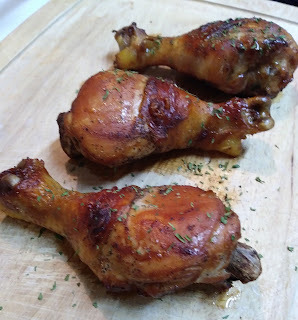 Pour mixture over chicken legs, seal the bag and place in refrigerator, marinade for 2 hours. Preheat oven 475. Line a baking pan with tin foil. Transfer chicken and marinade to prepare baking pan. Cook until brown and instant read thermometer reads 165 degrees, 30 to 40 minutes. Serve chicken with pan juices. Love how simple and easy this is, Christine! And, I know it can be done quickly, which is what folks want on busy week nights! So glad I saw this recipe. I have chicken legs and all thes other ingredients. Making this tonight. I can imaginf how flavorful these are! Yum! Quick, easy and delicious... This is the perfect weeknight meal!